#MurphyFootball #TeamFYNSports #DavidGentry #MicahNelson | Cherokee Co N.C.
After a big semi-final win over Robbinsville last week, the Bulldogs of Murphy High School made the trek to Wallace Wade Stadium on the campus of Duke University for the 2018 1A State Championship game. Their opponent, the Pamlico Hurricanes come as the higher seed making Murphy the visiting team. The captains took the field for the coin toss with the Canes winning the flip and choosing to receive the ball first. The officials spotted the ball and on the first play from scrimmage a well placed hit by Micah Nelson caused the Canes’ running back to cough it up and put it on the ground. Nelson scooped up the football and went untouched for 34 yards and a Bulldog score to put the Bulldogs up to stay. 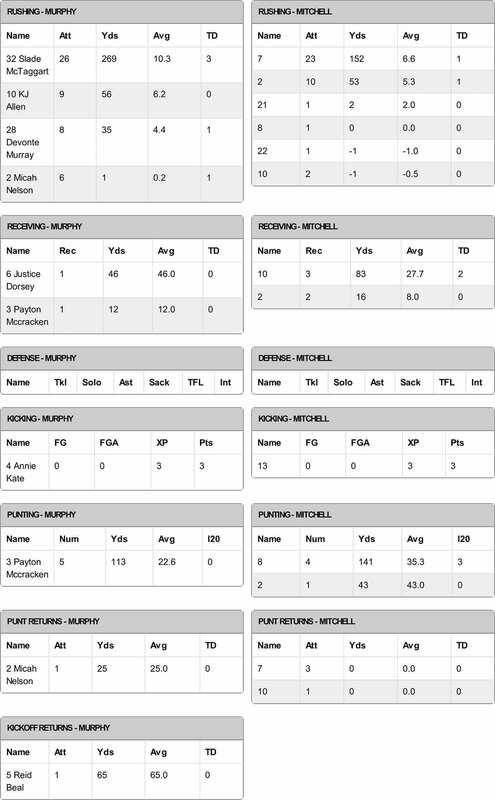 The Murphy offense was dominating all night without their leading rusher in Slade McTaggart. After a failed appeal, McTaggart was not eligible to dress out due to the previous week’s ejection. Coach Gentry and his staff felt the disqualification of #32 was unwarranted after watching the video of the incident. McTaggart was on the sideline cheering on his brothers on every play. Commenting on having to sit out, Mctaggart said: “It hurts not being out there with my team.” As real teams do, K.J. Allen and Devonte stepped up in McTaggart’s absence. Allen carried the ball for 163 yards on 19 touches and 4 touchdowns with Murray adding 2 scores on 8 carries for 109 yards. 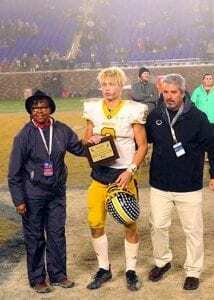 Ray Rathburn also reached paydirt with 1 touchdown in the State championship win. Coach David Gentry stated that his running backs performed very well and a lot of credit goes to his offensive line. The linemen blocked really good and opened holes to run through. Getting into the end zone 9 times, the Bulldogs had the Hurricanes on their heels all night. 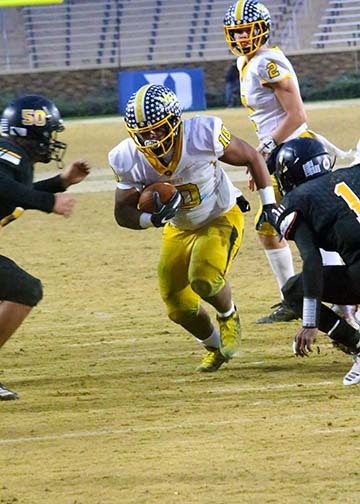 Pamlico rushed and passed the ball fairly well with 327 offensive yards and 27 points in the game. The strong defense of the Bulldogs bent but never broke. 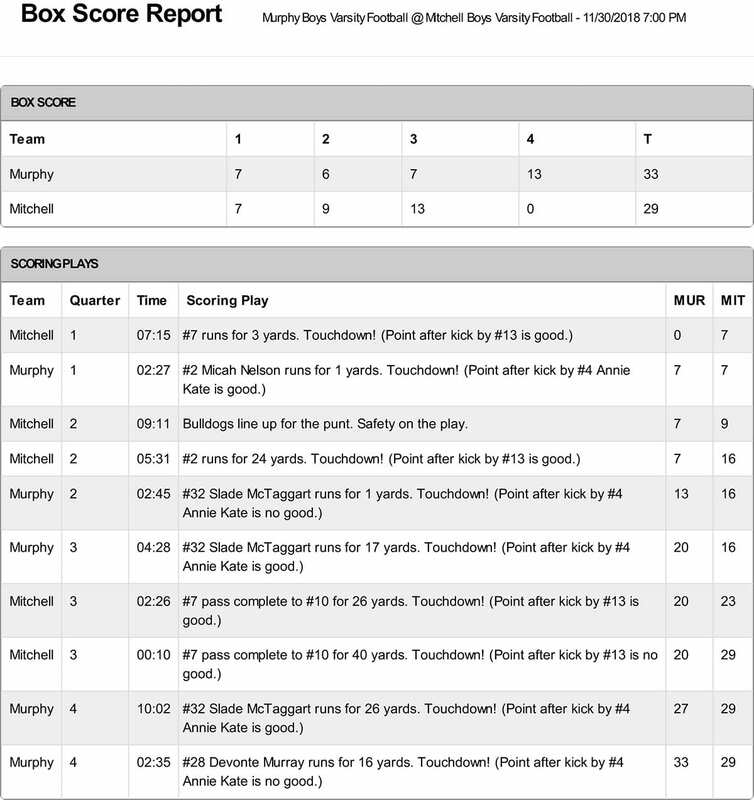 The Canes turned the ball over 5 times(3 fumbles and 2 interceptions) in the loss to Murphy. The first quarter had the Bulldogs put up a quick 21 points with Pamlico crossing the goal line once at 2:54 on the clock. With an uneventful second quarter, these 2 teams entered the locker room at the half looking at a 21-7 Bulldog lead. Coming out for the second half, Murphy received the ball and it didn’t take long for them to pick up where the first half ended. Nelson led his offense down the field. At 7:53 on the clock, #24 Ray Rathburn took the Nelson handoff for 11 yards and a Murphy touchdown bringing the score to 28-7. They would not stop there. K.J. Allen got his second of 4 touchdowns on the night with 2:41 left on the 3rd quarter game clock. Pamlico squeezed in a late quarter score to close the gap to 35-14. 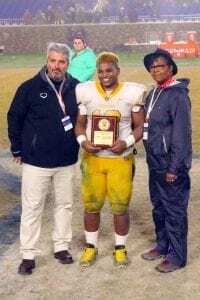 The Bulldogs closed out the final 56 seconds of the 3rd moving the ball down the field and on the first play of the fourth and final quarter Devonte Murray powered his way through the line breaking tackles and scampered 46 yards for yet another Bulldog touchdown. Allen and Murray dominated the offensive output for Murphy in the quarter. Allen scored 2 more times with runs of 12 yards and 23 yards and Murray added 1 more at 7:47 with a run of 31 yards for a game total of 60 points. The Hurricanes added to late touchdowns but it wasn’t enough to even put the outcome in question. The Bulldogs made a major statement to anyone that may have doubted they were good enough to be ranked. The 60-27 win over the higher seeded Hurricanes left no questions as who the number 1 team is in North Carolina Conference 1A football. This State Championship makes 9 for the Bulldogs and will be a contender next year as well. Congratulations to Coach David Gentry(See video below), the Murphy Bulldogs, and the entire town of Murphy North Carolina on bringing the championship home. Congratulations to Hunter Shope(Defensive Player of the Game), Micah Nelson(Offensive Player of the Game), and K.J. Allen( Most Valuable Player). Great game guys and your awards are well deserved. Last weeks’ semi-final win over Robbinsville may have sent the Bulldogs to their third State Championship appearance in a row but turned out to be the last game of a young man’s high school career. In the second quarter, Slade McTaggart was ejected from the game after the officials flagged him for a flagrant personal foul. The ruling was that McTaggart kicked a Black Knight player after making the tackle. McTaggart is the leading rusher for the Bulldogs and also a force to reckon with as a linebacker on the defensive side of the ball. 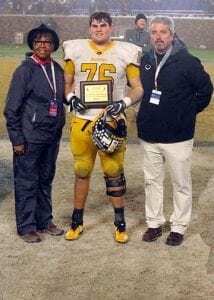 Coach David Gentry said after the game “We will watch the film and if we see something on there we will appeal the ejection and go from there.” The appeal was sent to the NCHSAA this week and on Wednesday the State Association upheld the decision to keep Mctaggart off the field for Saturday’s championship game at Duke University. Coach Gentry stated that the State got it wrong. The Bulldogs will face Pamlico County at 3:00 on Saturday at Duke University’s Wallace Wade Stadium for the 1A State Title missing one of their guys. Devonte Murray said after last weeks’ win that “That is what we do. 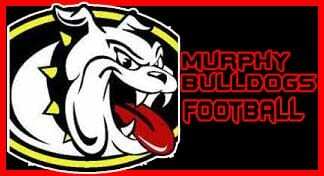 When someone goes down, we step up.” The game on Saturday will be an exciting opportunity for the Bulldogs to bring home Coach Gentry’s 406th career win and a State Championship for Murphy. 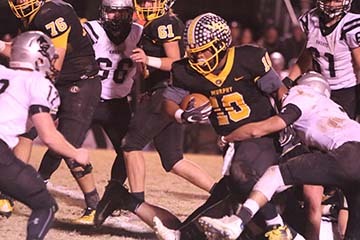 The anticipated rematch between the Robbinsville Black Nights and the Murphy Bulldogs took place last Friday with the winner etching their name on the bracket for the 1A State Championship. The Bulldogs had the victory back in September over the Knights and were looking to repeat history with another win and send their opponents home for the season. Coming off a late fourth-quarter win(33-29) over the Mitchell Mountaineers the previous week the Bulldogs were ready for the rematch. The Mountaineers advanced to the semi-final game after an upset(32-13) of the higher seeded Thomas Jefferson Classical Academy. The forecasted weather held and made a great night for high school football. Coming out of the locker rooms both teams were pumped and it showed as the captains took the field for the coin toss. Robbinsville won the toss and chose to get the football first and try and get an advantage from the start. The defenses for the Bulldogs and Mountaineers played strong throughout the first quarter not allowing either team to put points on the board. Things would change drastically in the second for Murphy as Micah Nelson and his offense stepped up the running game. Slade McTaggart and K.J. Allen found the gaps in the Robbinsville defensive front to start piling up the yards. 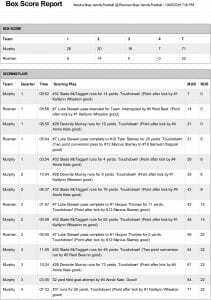 The second quarter also saw McTaggart break the zeros on the scoreboard with a 1-yard touchdown at 9:56 on the clock. Later in that quarter, McTaggart would be disqualified for the remainder of the game on a flagrant personal foul penalty. With the Bulldogs leading rusher now out of the competition Allen and others stepped up to get the job done. K.J. Allen scampered in fro 3 yards out for the Bulldogs second score. The home team offense lined up for a 2-point conversion and QB Micah Nelson took the ball on a keeper around the left side to complete a successful try and bring the score to 14-0 heading into the halftime intermission. Coach Gentry has his players pick up where the left off in the previous half. 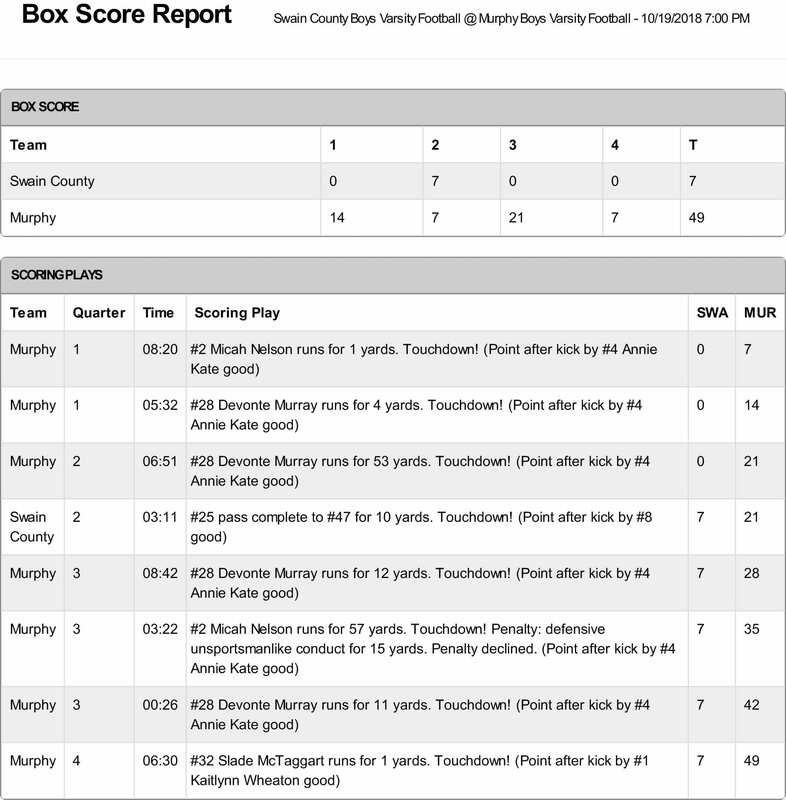 With 7:14 on the 3rd quarter game clock, once again Allen received the ball and fought for 7 yards and another Murphy touchdown, The extra point was good and the scoreboard changed to a 21-0 lead for the Bulldogs. Robbinsville started moving the ball a little more freely but the Dog defense quickly shut them down. With big hits and forced fumbles that were recovered by Murphy, the Black knights were once again kept off the board. The Murphy offense would add there their last score of the night at 4:23 in the third on a Micah Nelson 15-yard bootleg to take a commanding 28-0 lead. With the clock sitting at 43 seconds left in the third, Robbinsville broke their zero and crossed the goal line for their only score of the game. The Black Knight kicker missed the extra point and brought the score to 28-6. This would be the final score for the game as neither team was able to add points in the fourth and final quarter of the game. This big win advances the Murphy Bulldogs to the NCHSAA 1A State Championship game to be held on Saturday the 15th at Duke University. 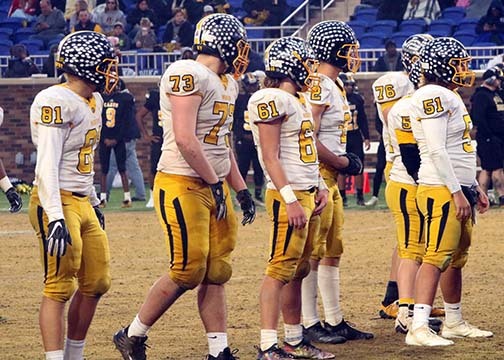 The Bulldogs will suit up against the Pamlico Hurricanes who had a narrow victory in their semi-final match-up. 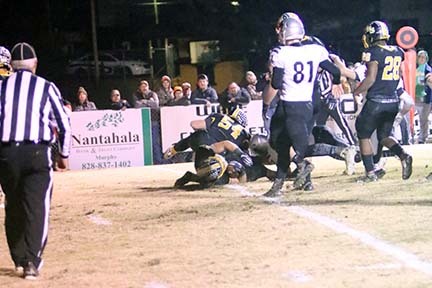 In continuing with their push for a North Carolina State Championship the Bulldogs of Murphy traveled to Bakersville for a battle against the Mitchell Mountaineers. The decision to play the game at a neutral site had Coach David Gentry up in arms as Murphy, the higher seed, lost the advantage of the hometown crowd. 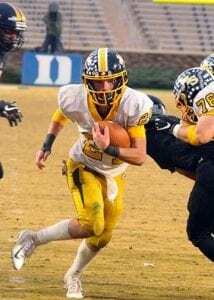 The Mountaineers were coming off a 3rd round victory over Cherokee the previous Friday while Murphy advanced with a big win over Alleghany 55-7. Last Friday night’s opponent posed the toughest challenge faced by the Bulldogs in the 2018 season and at game’s end that challenge was overcome by Murphy. Mitchell took the lead early on a 3-yard touchdown with 7:15 on the 1st quarter clock and a 7-0 lead. 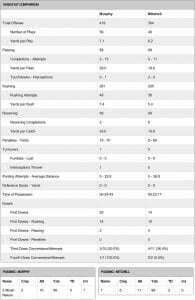 It wouldn’t take long for the dog offense to answer with a score of their own. With the clock sitting a 2:27 left in the first, quarterback Micah Nelson crossed the goal line on a 1-yard game-tying score. Misfortune hit the Bulldogs on a fourth down play when in punt formation, the snap traveled over the punter’s head and crossed the end line for a Mitchell safety resulting in 2 points. The Mountaineers received the ensuing kickoff and marched down the field to put another 7 on the board to stretch the lead to 9 points over the Bulldogs. The half came to an end after Murphy’s Slade Mctaggart fought his way into the end zone. The extra point attempt failed to leave the first half score at 16-13. The 3rd quarter began much like the start of the game. Mitchell scored 2 times in the quarter and allowed the dogs only 1 score to hold a 29-20 advantage heading into the final twelves minutes od the game. 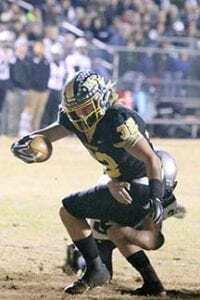 The Bulldogs defense stepped up and pitched a shutout to a Mitchell offense that had controlled the previous seventy-five percent of the game. Micah Nelson and his high-powered offense found a rhythm and put up two well-needed scores. The first of two late-game scores came at 10:02 on a 26-yard scamper to bring the Dogs within 3 points. 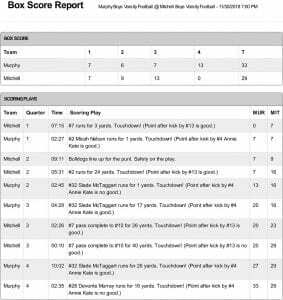 Devonte Murray put the game away for Murphy on a 16-yard touchdown with under 3 minutes left in the game. 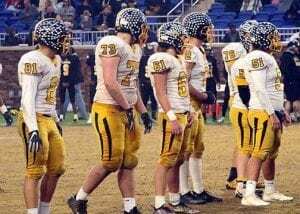 The Murphy Bulldogs survived for a 33-29 victory to end the 2018 season for the Mountaineers. In addition to a win that propelled Murphy to the next round and a step closer to the championship, this win also created a little history for Coach David Gentry. The victory over Mitchell moved Gentry past Bob Paroli in career wins as a head coach. Coming into the game Paroli and Gentry were tied at 403 wins in their amazing careers. Coach Gentry’s career wins now stands at 404 and just 9 victories away from taking the top spot in North Carolina High School History. Best of Luck to the Bulldogs this week as they take the field against a familiar foe in Robbinsville. This week’s semi-final match-up will be Friday night at home. Gametime is 7:30 and we say Let the Big Dog Eat! 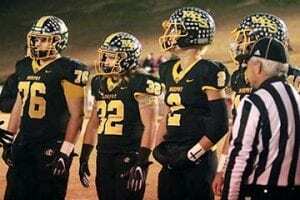 The opening round of the North Carolina State Playoffs had the Trojans of Alleghany High School come face to face with the Bulldogs of Murphy. With a dominating regular season, the Bulldogs are focused on reaching their goals one game at a time. After a 10-1 regular season record, each playoff win brings the Bulldogs a step closer to reaching their goal of a State Championship, Friday night’s game was the first opportunity for these guys to get the train rolling. Coach Gentry has had his team working really hard to prepare for the Trojans and with the time at hand, Murphy came out and took a dominating victory. In the 55-7 win, Micah Nelson(QB) and his offense once again put up a stellar performance. With 430 yards of total offense on 25 plays, Murphy scored at will crossing the goal line 8 times in just over thirteen minutes of possession. nelson was 5-8 through the air for 144 yards. Leading all receivers on the night was Reid Beal(#5) with 77 yards and 1 touchdown. Rushing the football is where the Bulldogs make their mark in a game. Slade McTaggart(#32) carried the ball 4 times for 143 yards and 2 scores. Devonte Murray and KJ Allen also had a good night with multiple touches in the win. With the offense doing what they have done all season, the defense gets the nod of excellence for the strength shown in this game. The Bulldogs allowed a total of 102 yards to Alleghany and just one score at the halfway point of the fourth quarter. The Dogs defense also forced 2 turnovers that led to points on the board for Murphy. 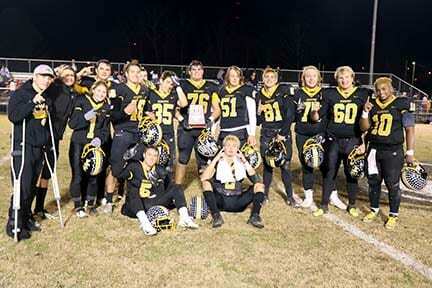 With the big win over the Trojans last Friday, they have punched their ticket into round two. This weeks game has the Mountaineers of Mitchell High School coming in and trying their best to end the run of the high powered Bulldogs. 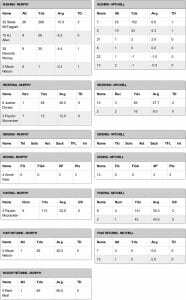 On paper, these teams are about as evenly matched as they could be. 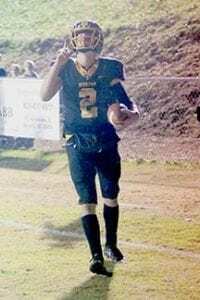 The Mountaineers have a running back and a quarterback that have a large number of rushing yards while through the air, SR. Noah Pittman isn’t afraid to let the ball go downfield. They are the best team the Bulldogs have faced all season and without any doubts, Coach Gentry will have his team ready to stand up to the challenge. 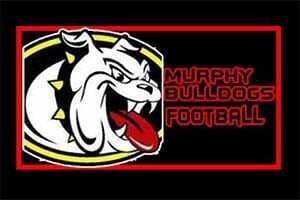 Go out on Friday and support your Murphy Bulldogs as they continue the winning tradition. Friday night the Bulldogs of Murphy faced the toughest challenge of the 2018 season as the welcomed a tough team from Cherokee. Trying to remain unbeaten, Coach Gentry’s Bulldogs started off a little slow but took control about the halfway point in the game. In the slow start, Murphy put seven points on the board at 7 minutes and 10 seconds on the clock. K.J. Allen(#10) took the football 32 yards to paydirt for his first of 5 touchdowns in the game. With a rare miss by Wheaton on the extra point, the Bulldogs had a 6-0 lead in the 1st quarter of play. Also unusual, the high powered offense of the Bulldogs didn’t register their second score in the game until late in the 2nd quarter on a 1 yard TD again by Allen(2 point conversion was unsuccessful). In the first half of play, Cherokee fought for 2 touchdowns of their own and carried a 2 point lead into the locker room at the intermission. Coach Gentry and his staff dealt with the issues of the first half play and the 3rd quarter proved to be what the Bulldogs needed. With 23 unanswered points, the Bulldogs opened up a commanding lead and never looked back. Justin Dorsey(#6) took the opening kickoff down the field for 84 yards and a Bulldog touchdown putting Murphy up for good and a 49-28 conference win. Several Bulldogs performed well but leading the stats for the game was none other than K.J. Allen. Allen scored 3 more TD’s to total 5 for the night. He did this on 15 carries for 189 yards rushing with 2 receptions for an additional 42 yards in the game. The Bulldogs had 423 total yards on the night that brings them ever so close to having an astronomical 5000- yard season. The defense of Murphy has been strong this season as well allowing 1275 yards rushing an only 1098 through the air. The Bulldogs are preparing to make another run through the playoff brackets and return to the battle of the best and play for another State Title. GO BULLDOGS!! In a rare Thursday night game of high school football the Murphy Bulldogs and the Rosman Tigers clashed on the field. Once again the high powered scoring machine of Coach Gentry’s Bulldogs had the batteries charged and ready. The scoring happened quick for Murphy when #32 Slade McTaggart scampered 14 yards into the end zone putting the Bulldogs up by 7 with the extra point by Kaitynn Wheaton. Murphy never looked back from that moment forward. Getting in on the scoring was defensive back #5 Reid Beal. With 8:56 on the first quarter clock Beal intercepted a Tiger pass and took it back for another quick touchdown bringing the score to 14-0. The Bobcats put up 4 touchdowns in the first quarter for a 28-8 lead heading into the second, Devonte Murray added 1 and McTaggart strolled across for his 2nd of the game at 3:54. Murphy’s offensive onslaught couldn’t be stopped. The second quarter saw the Bulldogs take a commanding lead putting up 20 more on 2 scores by McTaggart and the second Touchdown in the game by Murray. The Tigers of Rosman scored twice in the quarter to bring the halftime score to 48-22. The third and fourth quarters was all Bulldogs. With the game basically out of reach of the Tigers, Murphy put 16 on the board in quarter 3 and 7 in the fourth to close out the dominating victory 71-22. Slade McTaggart had 5 TD’s and Devonte Murray crossed the goal line 3 times for the Bulldogs. These two ran for a combined 384 yards on 17 carries. The total offensive numbers for Murphy were phenomenal. Led by #2 Micah Nelson the Bulldogs had 745(629 on the ground)total yards on 48 plays from scrimmage. Possession time in the game was heavy to the Tigers at 30:03 while Murphy had the ball for just 17:57. Next Week the 8-1(5-0 in conference) Bulldogs will host Cherokee for a another big game in their quest to take an undefeated schedule into the post season. Game time is 7:30 so come support your Bulldogs! Next Article » The Great Awakening, You Can Look It Up! 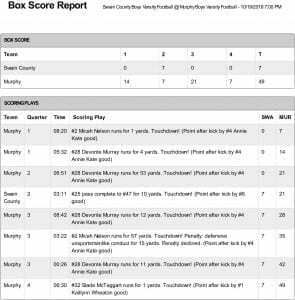 Friday night was a another big game for the Bulldogs of Murphy High School as they faced the Maroon Devils of Swain County. Once again Coach Gentry had his team fired up and ready to complete the task and get the victory. With just 41 offensive plays and a possession time of 18 minutes and 30 seconds the Bulldog offense put up 396 rushing yards in the dominating 49-7 win over Swain Co. 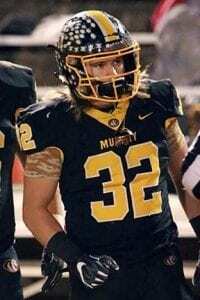 Leading the charge in the running game, #32 Slade McTaggart carried the ball 13 times for 123 yards. Taking some of the load off the legs of McTaggart was #10 K.J. Allen(9 carries for 99 yards) and #28 Devonte Murray who had 95 yards on 9 touches. 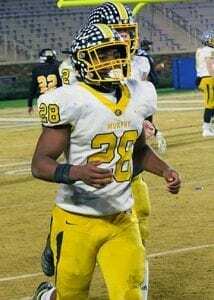 With the running game firing on all cylinders quarterback Micah Nelson threw the football twice with both being completions(2 of 2 for 39 yards). The very strong defense for the Bulldogs held the Maroon Devils to 152 yards of total offense on 52 plays and 1 touchdown. 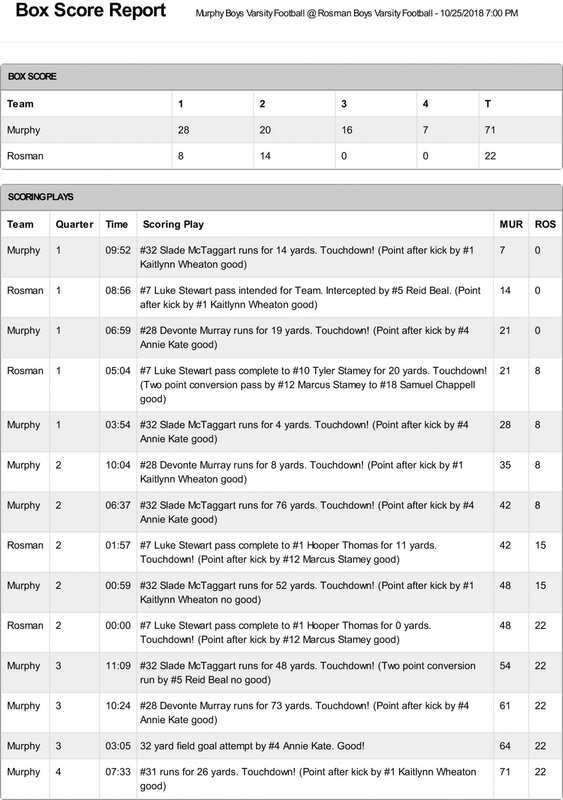 The seven touchdowns for Murphy came on the legs of Nelson(1 and 57), McTaggart(1 yard), and Murray with runs of 4, 53, 12 and 11 for touchdowns. As perfect as the stats seem there is one stat that Coach David Gentry and his staff never want to see again. 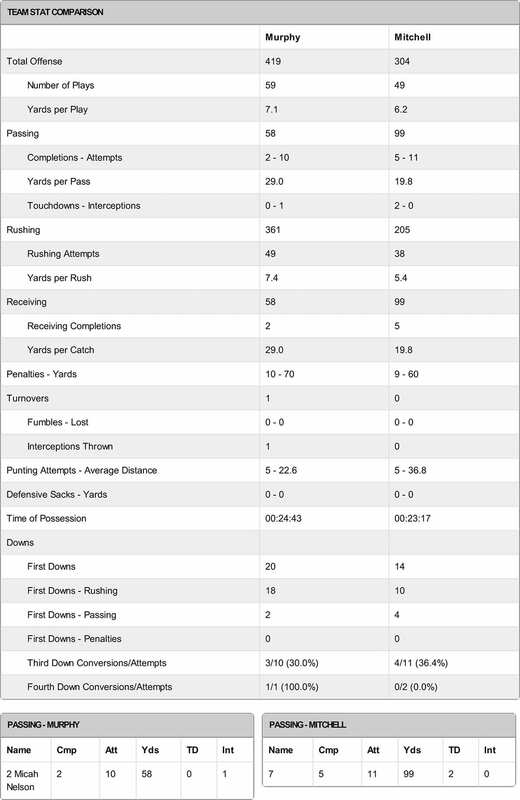 The Bulldogs had 12 penalties for 115 yards showing that no matter how well a team runs and passes the ball or even how much a team scores there are still things in a game the coaches need to get their players better at doing or not doing. Murphy will travel to play Rosman next Friday to try and get yet another wit to bring their record to 8-1 overall and continue the undefeated conference schedule.